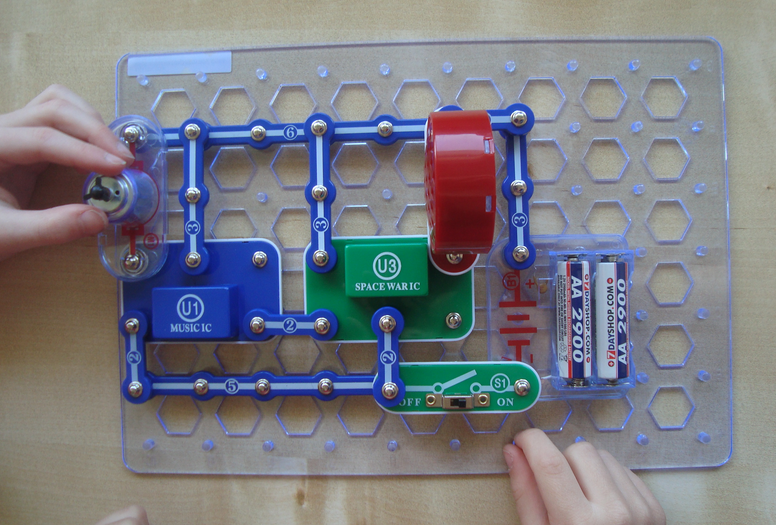 My son has been playing with Snap Circuits recently so I thought I write up a review of how we got on. 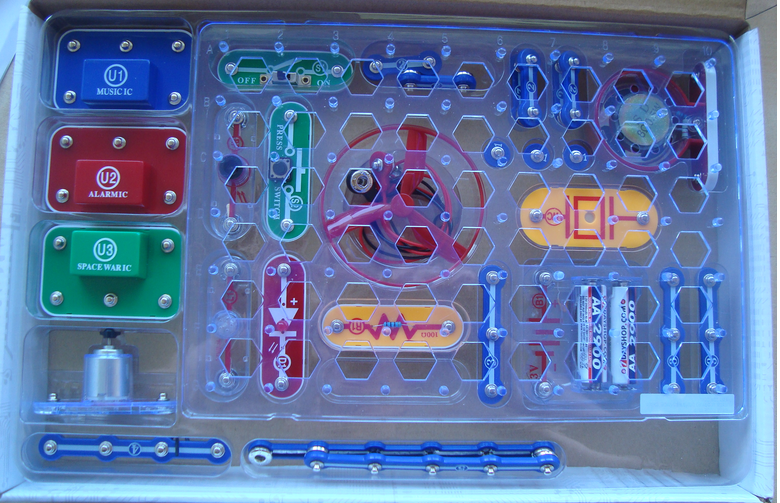 Elenco Snap Circuits is a range of electronics kits for kids. It teaches kids about the principles of electronics circuits in a very hands-on way. Each kit includes a plastic board to build the projects on, a set of electronic components that snap to each other and to the board, and instructions for lots of projects to make with the kits. There's no soldering involved. My son is 6 so we've started with the Jr kit which has 100 projects to make. One thing I really like is that you can get upgrade kits that extend the basic kit so we'll be able to add to our set when he's ready. The reaction from my son has been fantastic. He has been choosing his electronics set as a before and after school activity since we got it a couple of days ago. He has been working through the projects following the instructions and being really pleased when it works! Each project has a clear layout which shows which pieces to place on the board in what order. You do need to put the pieces down in the right order and for some of them direction is important too. I think my son's extensive experience with following LEGO instructions has helped a lot here. The board isn't necessary to make the circuits work, it just helps keep the layout clean and easy to match to the diagrams. The projects have lots of cool features that really appeal to kids like annoying noises and a fan that can spin up into the air to make a flying saucer. At first I was a bit concerned that he was just recreating the circuits and not learning much. But one morning he swapped out a resistor for a wire because he knew it would make the sound louder (because it won't resist the electricity as much, he explained.) And then he realized that his circuit wasn't working because it wasn't joined up to make a circuit - he had missed out a wire. I think he'll learn more as he goes through the models a second time as well. There is explanatory text for each project which explains what is happening. He's very keen to experiment but you can actually break components if you set up a circuit incorrectly (don't worry too much, you can get free replacement parts) so he needs a bit more knowledge before he does that. He has been able to make some sensible modifications to existing projects with Mum or Dad checking it over before he powers it on. But if you don't have any electronics knowledge you might need to learn some yourself first! His Dad is very capable while I seem to have forgotten a lot of what I used to know so this is a good way to brush up on my own electronics. There's plenty of scope here to really learn a lot about basic electronics. This is very much a proper educational kit that is suitable for home schooling or just covering topics that kids don't get to study in school. 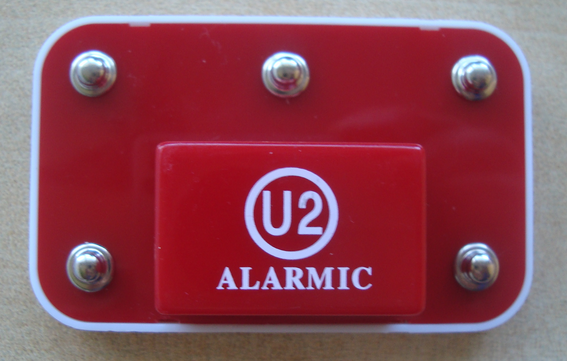 There is some basic information at the beginning of the project manual which explains what all the components do and what their various connectors are - power + and - and input controls and outputs. I wish these were marked on all the components. They are on some of them but strangely not on the audio components that have several connection points. It's easy for kids to miss the fact that they are connecting to specific connectors for a good reason. I guess we can fix that with a Sharpie. At the moment my son is a little resistant to slowing down and reading all the useful information because he's having so much fun! But I've been trying to slow him down a little and go through things like what the various inputs and outputs on the sound chips are actually for. I'm also going to try and find him a good electronics book for young kids that he can read. He tends to prefer non-fiction titles so he would actually enjoy that if I can find the right book. Basic electronics isn't actually all that complicated. There's just a lot of unfamiliar terminology to pick up. We're looking forward to more episodes of Adafruit's Circuit Playground kids show to help both my four year old and six year old learn the basics. Snap Circuits has really captured my son's interest. I can see him requesting an extension set and I've got my eye on the Elenco Snap Circuits Green - Alternative Energy Kit with solar power and a hand crank and lots more fun stuff. And one of my favorite things about these kits is that they come in a box with a storage tray that makes it really easy to pack everything away and spot if there are any pieces missing. My son actually seems to enjoy putting the pieces away in the box when he has finished. I'd say these sets are suitable for a wide age range with younger children benefiting a lot if a parent is willing to work alongside them and older kids being able to pick up a lot more understanding of why it all works. For older kids choose one of the larger sets with more pieces and projects as they will be able to move more quickly.